The ACR System™: The ACR System™: Delivers longer battery life, smooth, precise speed control, quick acceleration, less downtime, and up to 33% more energy efficiency and 6% greater productivity. Don’t just take our word for it – calculate your savings. Durable Construction Throughout: From the heavy-duty undercarriage to the rugged polymer cover that won’t rust, fade or dent, these trucks are built with the right material for the job. 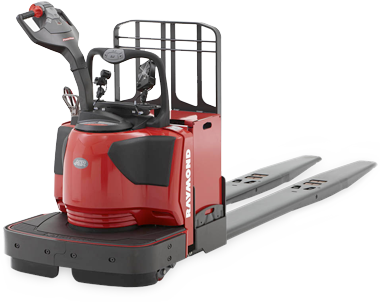 See how Raymond pallet trucks are designed with unparalleled durability. Advanced Engineering: With fewer and longer lasting components that require less maintenance, and engineered to handle high volume dock work, horizontal transportation and low-level order picking with ease. Outstanding Operator Comfort: Control handle and grab bar designed to fit the hand plus roomy platform with convenient lean points.